Our staff has been with us for 20 years and counting, so we are able to offer a level of industry experience that allows us to tackle a project of any size or degree of technical difficulty. The Main Frame, located at 1386 Hertel Ave., opened in 1988 as a small retail frame shop and production facility for Vern Stein Art and Frame. 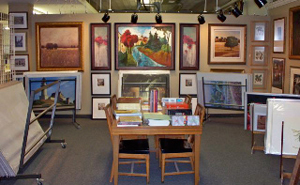 We have since grown to over 6,000 square feet that includes our in-stock moulding inventory and on-site custom framing operation that not only services the framing needs for Vern Stein Art and Frame, but also the large clientele that Main Frame has built up over the years. With our extensive experience and state-of-the-art production facility, we have the ability to produce large volume frame orders as well as individual, custom-crafted items, such as sports jerseys, christening gowns, etc. Main Frame has a large inventory of print reproductions along with an extensive collection of antique prints depicting the Western New York area from engravings to maps. Our talented staff has over 40 years of experience in the picture framing business and we take great pride in knowing we have been able to tackle any job that has come our way from the simplest individual task to the most complex.